I was told by my science teacher in year 9 that "Silence is golden!" when I failed to hear the call for the register to be taken. That moment of lapsed attention resulted in a break-time detention, while I struggled to explain why "silence was golden" in 100 words. Needless to say, I struggled, because, erm, silence doesn't translate easily to the written word for me: even while I'm writing this, the words make a noise in my head. But in this modern world of communications, the exact opposite is true! So firstly, I must apologise for the unnerving silence here: blogspot doesn't seem to like me posting images from my mobile device when, as we also know, that "a picture paints a thousand words". With that in mind, I've decided to move on to tumblr for my blogging needs: take a look, let me know what you think. And here's to no more golden silence! Today, Rob and I decided that we needed to bag one of those classic routes that everyone says you MUST do: Amphitheatre Buttress on Craig Yr Ysgfa. So we met at The Moel Siabod Cafe at 8am, parked up, and slogged up the waterboard road, arriving at the foot of the climb at about 9:30am - first on the route! The rock was mostly dry, but there was a little bit of seepage on the first pitch. I decided that rock shoes were overkill so instead climbed in my 5.10 Camp Fours, which were grippy enough, but sometimes a bit more flexible than I would've liked. The route was well-polished, so we were able to follow it without reference to the guidebook (which I'd left at home anyway...). After an excellent day's exploring, we decided to not over-extend ourselves, so left Pinnacle Wall (S) for another day. Instead we headed back to the car (1 hour) and enjoyed some light refreshment at The Moel Siabod Cafe: hot chocolate (with everything) and cake - yum! Christmas Curry on May Day? 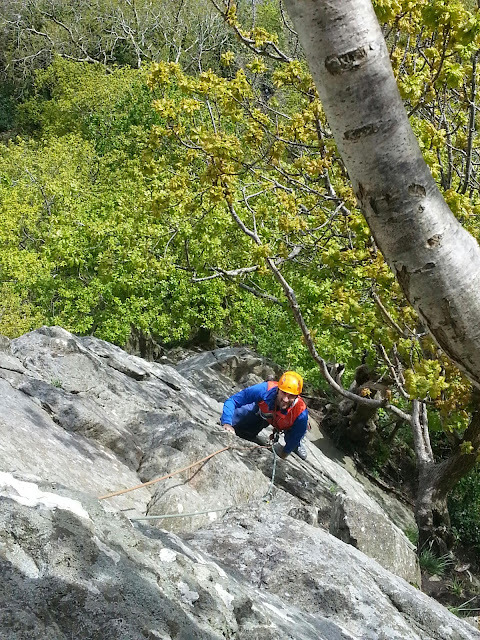 Not strictly a mountaineering day, but instead some quality and classic trad multipitching. 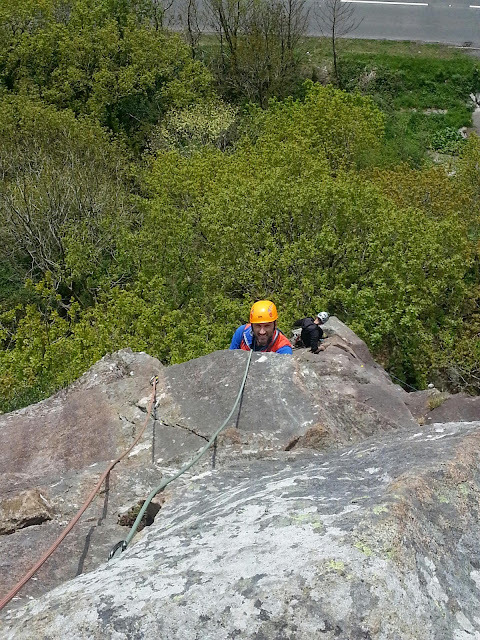 Today, I was joined by Rob at Bwlch Y Moch, the BMC-owned cliff at Tremadog. We were lucky enough to have Three Bears weather (not to hot, not too cold; juuuust right!) for the ascent of the exposed and bold Valerie's Rib HS 4b, followed by the original Christmas Curry S 4a route. Rob and I are both consolidating our leading and SPA skills, so we were able to share, discuss and criticise each other's placements and choices, all while bagging classic routes and with the impressive amphitheatre that is Dyffryn Glaslyn as a backdrop. What to do when it's too wet to climb? 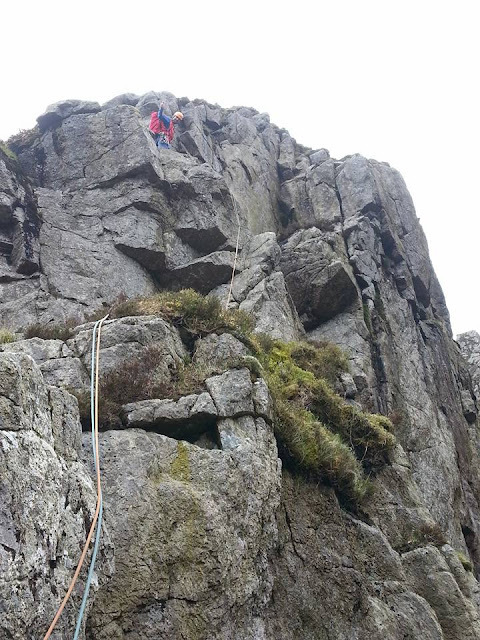 Sunday is the regular climbing day for Clwyd Mountaineering Club, of which I'm a member. 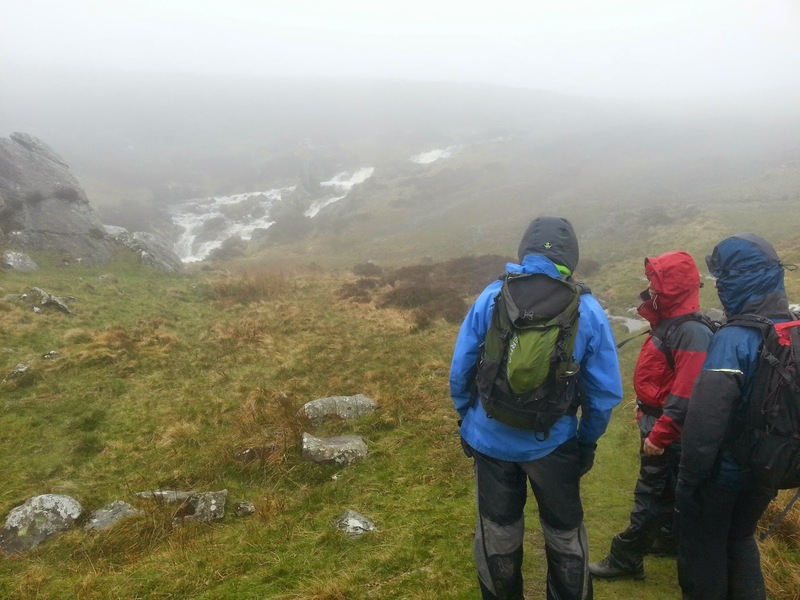 Unfortunately, the weather this Sunday was appalling: drizzle, heavy showers, wet, and grim, with the rivers full of impressive white water. 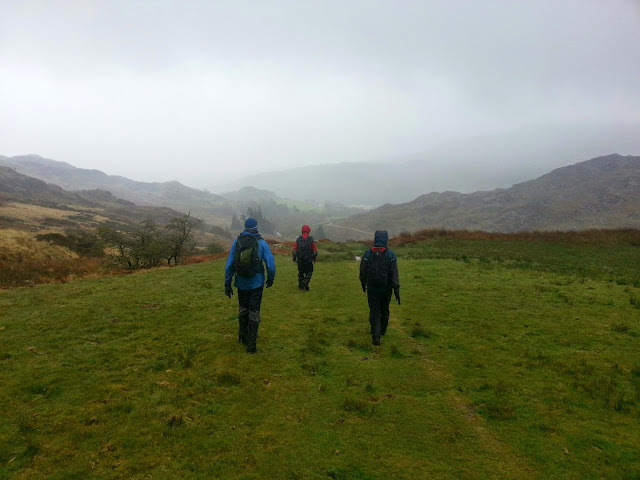 So a group of four of us instead plumped for a walk from Capel Curig, over the Crimpiau and Creigiau Gleision, returning via the north shore of Llyn Cowlyn. It actually turned into quite a nice day once the cloud lifted a bit and the sky brightened. We even had blue sky for oh... 5 minutes! 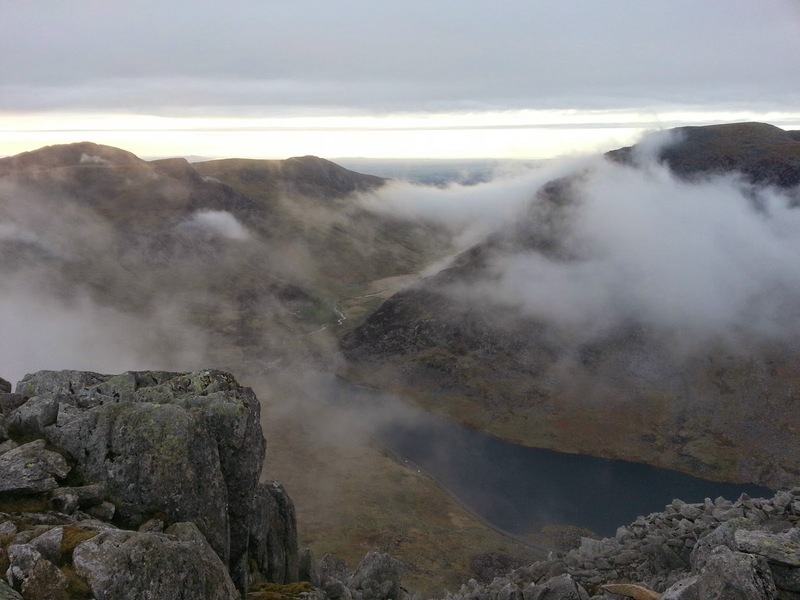 I decided to trust the Met Office forecast completely tonight: it said Tryfan's summit would be cloudy until about 7pm, when the clouds would break. Well, what a treat! I seem to be getting a bit behind with my blogs, so it's time for a catch up. And this one's a grand microadventure! At the beginning of July, Lizzie came to stay with me for a few weeks. One of the things I've been promising was that we'd sleep on top of a mountain, so as soon as we could, we did. 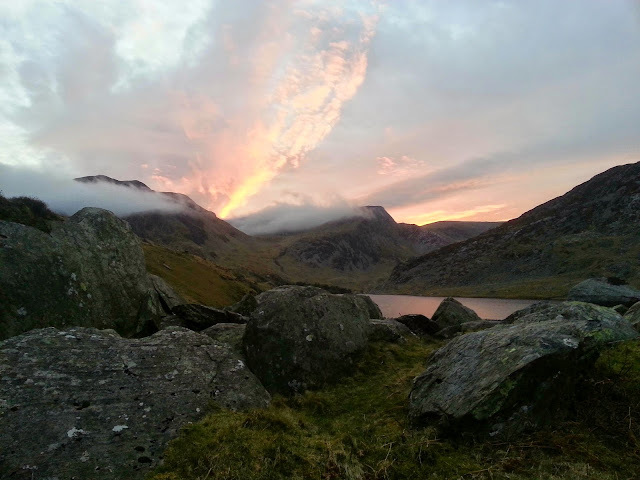 We started just around tea time from a layby near the foot of Tryfan. The weather was mild, high pressure, warm and still. We ascended from the car park, first following the path, then bearing left. From here we cut across and up the gully over the top of Craig Bochlwyd, heading for to the Llyn (of the same name) that nestles in between Tryfan, Glyder Fach and Y Gribin. The ascent was quite steep, but I was surprised how easy it was to motivate Lizzie up the steep slope. Even Tangfastics were not required! Once over the top, a small but conquerable patch of marshy ground slowed us briefly, more because I didn't have waterproof footwear on, than anything Lizzie couldn't cope with. Once beyond this, we arrived at the outlet of the Llyn, and continued westward. On the west side of the lake is a perfect camping venue: a large and flat ancient moraine heap, deposited about 10,000 years ago by a dwindling glacier at the end of the last Ice Age. Since then, nature has taken it's course, covering the rock with enough soil and grass to get a pegs into. Close cropping by the native sheep and goats have transformed it into something of a perfect camping venue, where the grass is short and rivals most commercial campsites (even those elsewhere in the valley) and which charge for the privilege. The wind shelter is also pretty good from the mountainous amphitheatre surrounding the Cwm. I pitched my Wild Country Zephyros 2 quickly, then fed us both on my small but perfectly-formed MSR microrocket: First Lizzie had chicken noodles, while I prepared my usual roast vegetable couscous with a packet of instant potato and leek soup (700 calories right there!). A small circle of fire-charred stones, left by a not-so-environmentally-conscious previous visitor, acted as my windshield. The ambience of this place is slightly strange at this time of summer. The shadow cast by Y Gribin onto the cliffs of Bristly Ridge and Glyder Fach doesn't seem to change very much. The angle of the ridge must exactly match that at which the sun sets. This means that half of the cwm is in shade and half in sun, all evening, right up until the moment when the sun disappears, leaving an instant, chilly twilight. Despite wearing my down jacket, Lizzie was soon getting cold, so as the blue sky faded, we settled down in our sleeping bags. Lizzie slept like a log right through until about 7. I, however, was awake just before dawn, and able to sample the sunrise, a spectacle of almost the same light as sunset. The wind had stirred slightly in the night, and was now quite a stiff breeze. I wasn't keen to hang around with a potentially chilly 8 year old, so after a fairly basic breakfast of croissants and cereal bars, we headed back to the car and home, a little weary but happy. Daddy has said he'd take me up another mountain. When I was on holiday, I asked him, "Daddy, are we going up Snowdon?". Daddy hadn't actually thought about taking me up that one! So one hot, dry Monday, Daddy organised a trip. 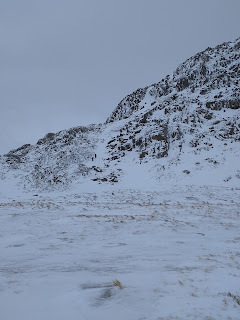 Eventually we reached the Miner's Path and the lakes in the Snowdon Cwm. The water was so low! we walked around the path, and it started to go uphill again. I was getting hot and bothered, but Daddy managed to encourage me a bit by rewarding me with Tangfastics every so often when I reached a corner, or made it past a rock. Eventually, we reached another lake at the top of a big waterfall. At this point, Daddy asked if I wanted to walk, or to scramble. "Scramble, of course!" 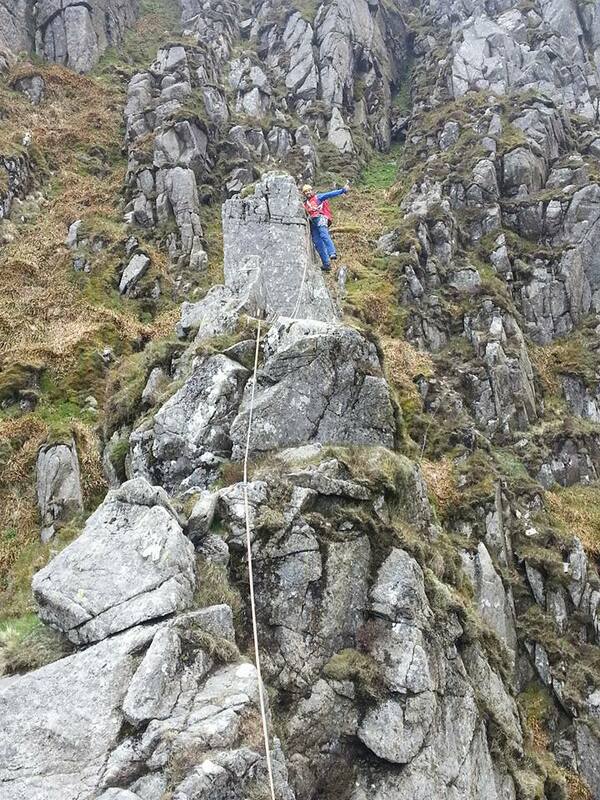 I said (I do like climbing!). We crossed the stream at the top of the waterfall, and Daddy led me up a scramble called 'Y Gribin' in Welsh ("Eeee Gribbin"!). I went first so that Daddy could catch me if I slipped. It was pretty easy climbing though, with lots of big flat shelves. Daddy is doing his Mountain Leader training, so I let him practice emergency ropework by belaying me up some of the steps. It's all good fun! Eventually we reached a small lake at the top of the scramble. The lake had tiny froglets swimming in it. Daddy even managed to catch one in his hands. 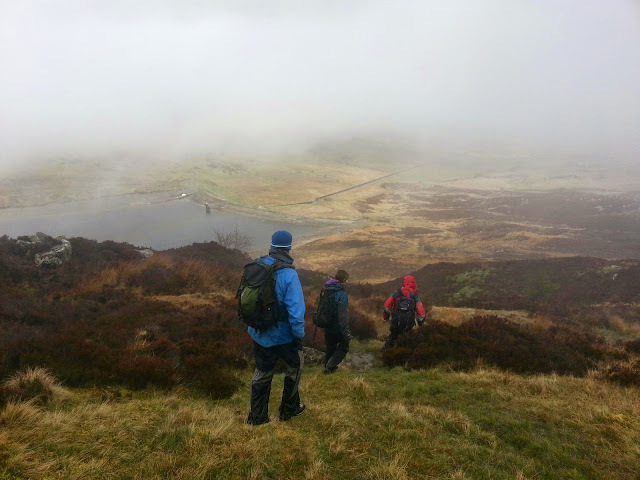 The path upwards went into the clouds: brilliant, another chance to see if they still taste of Candy Floss! As we went up into the clouds, I began to get a bit tired. Daddy said, "Come on, Lizzie, there's not far now. And when we get to the top we can have a drink in the cafe." "There's a cafe at the top of Snowdon? You didn't tell me that!" If I had known, I would've run up there! When we got to the cafe, we went in side to warm up a bit, and the clouds cleared briefly to give us a view. Unfortunately they only had hot drinks or fizzy drinks, so I just drank my water. Even the vending machines were out of order so I couldn't get any chocolate. 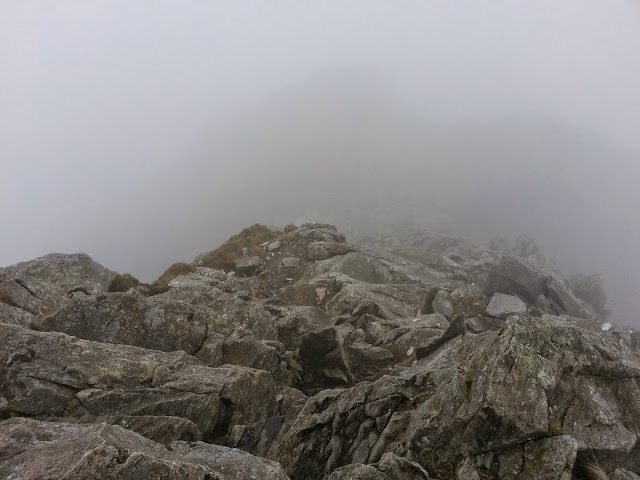 But I did get a badge that said "I made it up Snowdon the hard way"! 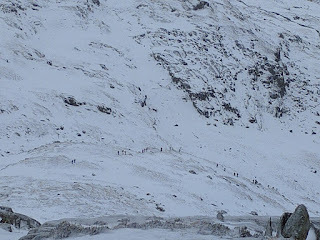 When we left the cafe, we went to the summit of Snowdon for a photo, then headed down alongside the railway line until a large stone showed us where the PYG track started. I prefer walking downhill to up. I could look at all the nice views. As we passed through the Bwlch y Moch (Pig Pass) a mountain runner passed us. I thought, "that looks fun," so decided to run most of the way back to Pen Y Pass Car Park. Daddy decided we should continue running on the road too. We were back at the parking in no time. Thank goodness tomorrow is a rest day and another lie in! This May Spring Bank Holiday was the first time that my ML (S) Training group had been able to get together since August. The group consists of Mark (who lives 'dahn sahf') and Rob, who is now North Wales based, and with whom I have managed at least 1 QMD (reported elsewhere in this blog). So what was the plan? 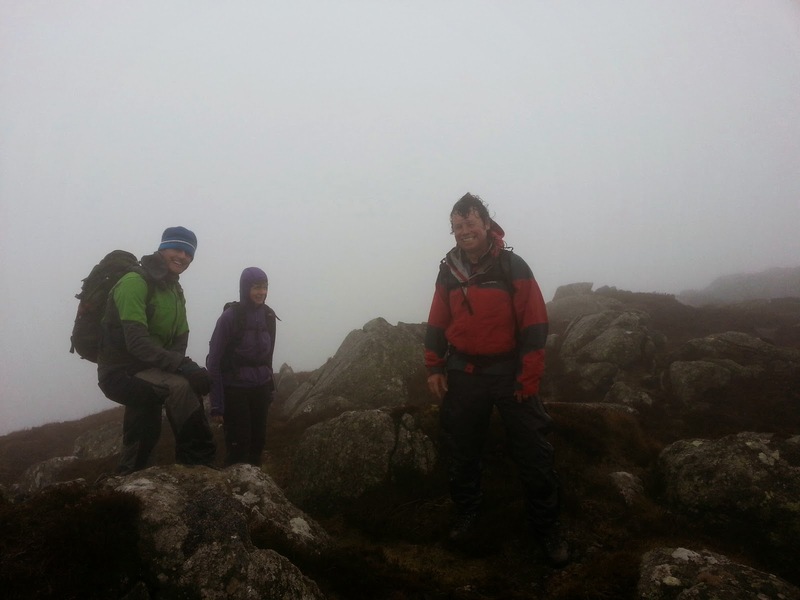 2 QMDs involving lots of scrambling, a minimum 5 hours, and possibly some navigation. You'll have to excuse the brevity: it's almost a week since this outing and I've had another tiring mountain day today. So I'll let the pictures do the talking, as much as I can! The route for today was North Ridge of Tryfan, Bristly Ridge, then descent by Y Gribin. I asked whether we could do an alternative start, especially because I've done the standard North Ridge start a couple of times. So instead, we headed around the right base of Milestone Buttress and took in the dark, foreboding, soggy, but excellent (despite the midges!) Milestone Gully. This is a 50m grade 2 scramble over wet but grippy rock. Mark was a little wary about the exposure, but we'll forgive him because it's the first time he's been in the mountains for about 8 months! 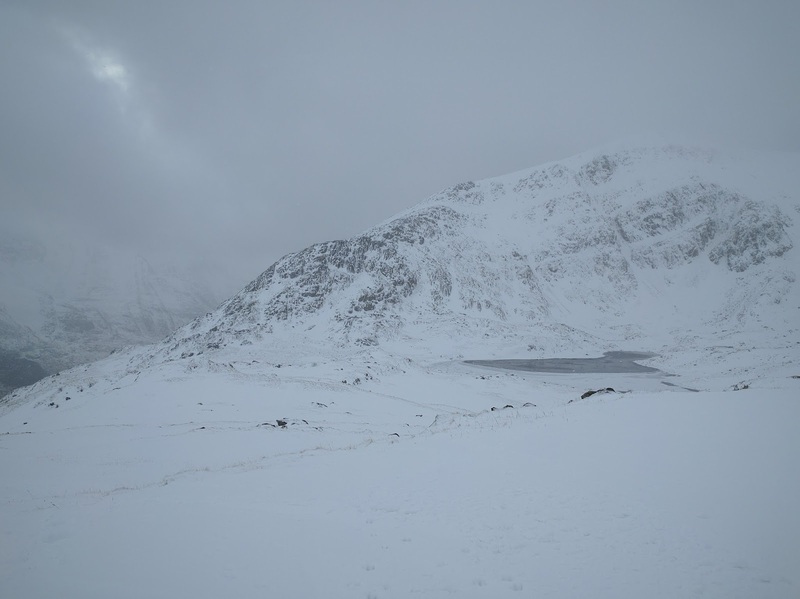 We continued rapidly down the south side of Tryfan, not adhering to the edge and aiming to gain some time to keep us on track. Next up was Bristly Ridge, a grade 1 scramble that can be very dangerous. A couple of sources have since mentioned that one of the gullies has a very dangerous and loose block: unfortunately, we were unaware of this fact at the time; fortunately, today was not the day for the block to fall. After scrambling out of the gullies, we gained the pinnacles after which the ridge was named, and continued to the summit. Once atop Bristly Ridge, we were gifted clear skies and fantastic views, so much so that the Cantilever Stone was simple to find. The rock around the Cantilever was completely dry, which made getting onto it much easier than the last time I tried, which I think was in heavy rain, or ice, or something, earlier this year. Anyway: dry rock = easy cantilever pics. 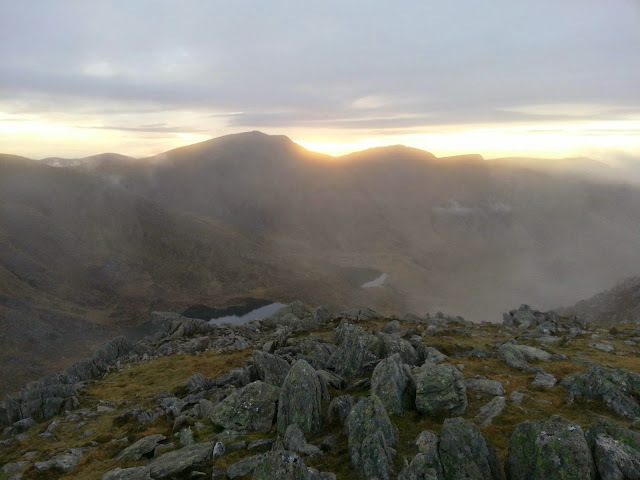 We then headed to the summit proper of Glyder Fach (something else that I rarely do), traversed that, then scrambled over Castell Y Gwnt too en route to Y Gribin. Here we descended rapidly, covering the ground without mishap, gaining the path back to the Milestone Buttress car park. 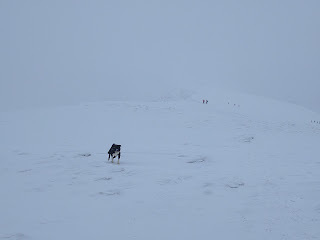 The day was rounded off nicely with refreshments at the Siabod Cafe: for me, an indulgent hot chocolate with everything (cream & marshmallows) as well as a large piece of (well-earned, I think) Lemon Meringue Cake. Ah! 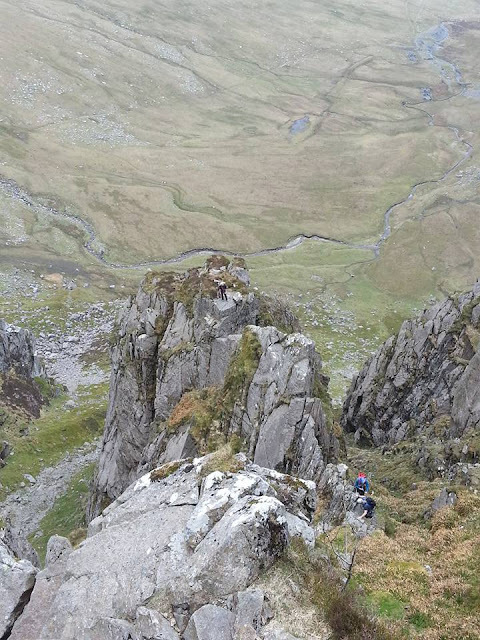 Today's route started from Cromlech Boulders in the Pass, up the beautiful and serene Cwm Glas, crossed to ascend the screes to Crib Goch's North Ridge, then continued the main traverse of Crib Goch and Crib Y Ddysgl, finishing with a descent back toward Cwm Glas via Gyrn Las. 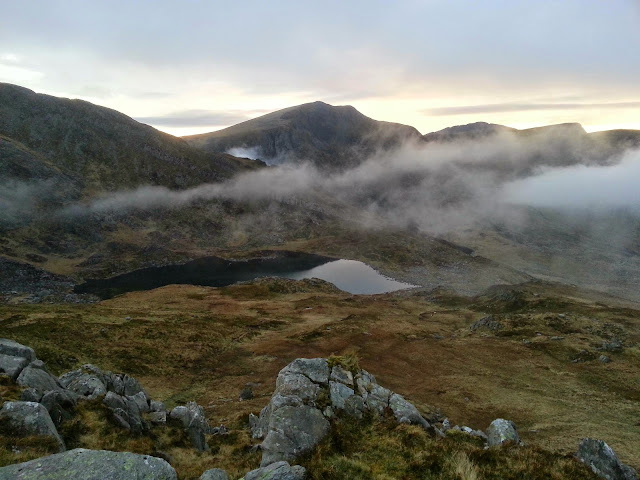 We met at Siabod Cafe for approx 0830, and bumped into Paul Poole, one of the reasons that we were here gaining Quality Mountain Days for our Mountain Leader qualifications, for a brief chat. 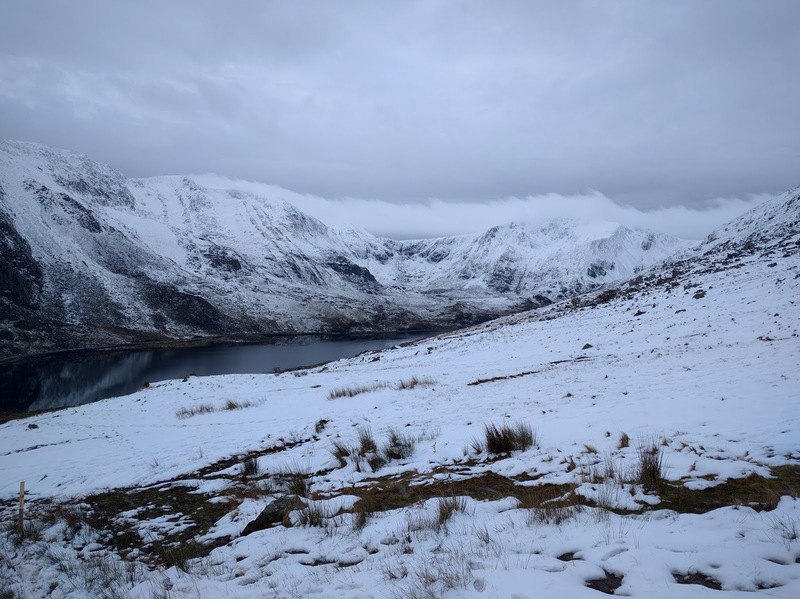 However, our main concern was the weather: As I'd driven along the Ogwen Valley, there'd been very heavy downpour; but the forecast was for clear weather after 9am. So we tarried a while before setting off for our start location in the Llanberis Pass. The walk started from the Cromlech Boulders, halfway down (or up, if that's the direction you're travelling) the Llanberis Pass, just after (or before!) Cromlech Bridge. The lay-by parking had just filled, but there was still lots of space between the boulders for us. The heavy rain (both this morning's, and overnight) meant that Afon Nant Peris was very full and not easily crossable, a stark contrast to earlier in the year when it had been easy to step from stone to stone. We chose not to get our feet wet at this early stage and crossed at the bridge. The slopes up to Cwm Glas are fairly steep, and there are no real paths, only boulder fields and sheep tracks. But it's a place full of beauty and solitude. We saw only 3 other people descending, probably from a wild camp. We took some time to catch our breath, enjoy the views and absorb the atmosphere around Cwm Glas. It is quiet and serene, despite being on Snowdonia's busiest mountain massif. I've even been here when there's been 70mph southwesterly winds forecast, meaning this spot was largely sheltered by the surrounding ridges. The occasional gusts whipped up the surface of the lake into racing, dancing wisps before they were just as quickly blown away. 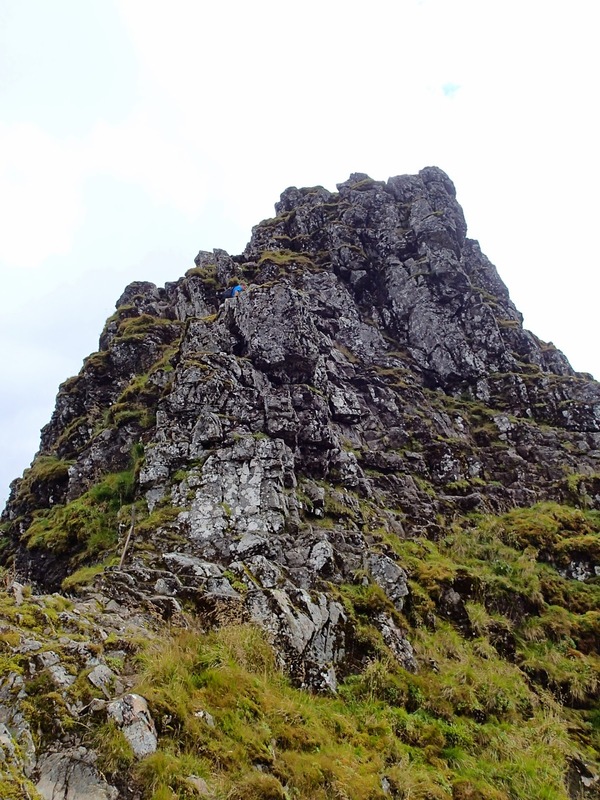 Eventually, the hell of this scree slope ended, and became the sharp but friable rock that is the North Ridge. This route is frequented far less than the main route, so the polish was minimal. 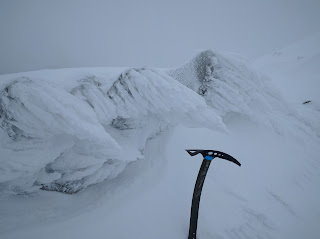 A cool breeze from our left (the east) cleared away the midges and soon we had arrived where the east ridge meets the main traverse. 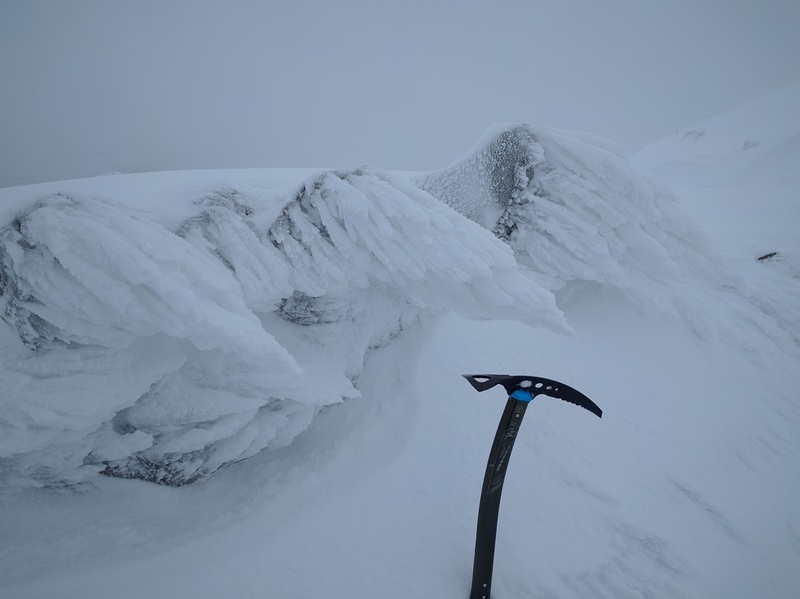 Here we were lucky: the winds were light enough to almost stroll along the tops, taking care with each step and gently transferring weight from foot to foot. Sometimes the steps were a bit slopey so our hands were used, and at one point we courteously passed a (French?) couple who were moving a bit more cautiously than we. Soon, the ridge turns into a number of pinnacles. You could walk around these; we chose not to, to keep the experience and fun of hands on rocks going. 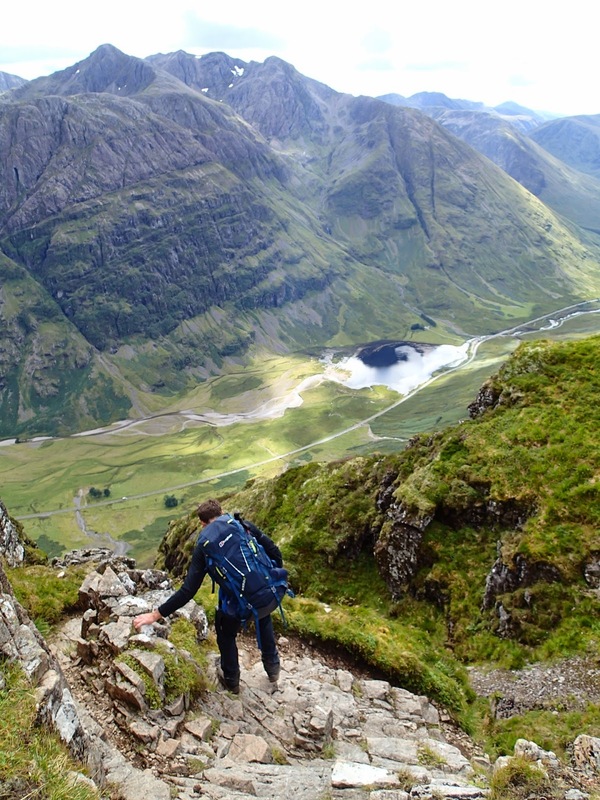 And then the path drops down then continues up onto a 'bold' traverse. You wouldn't want to slip here(! ), but the rock is wide, the handholds are good and the protection from the wind is excellent. And it's a fun bit of good climbing. We continued on, over Crib Y Ddysgl, with more scrambling. By the time we had arrived at the end of the ridge proper, the cloud had descended. Now was our opportunity to NAVIGATE! We quickly found the Trig point in the fog, took a bearing of around 285 degrees for 100 metres or so, then changed direction to head directly north. 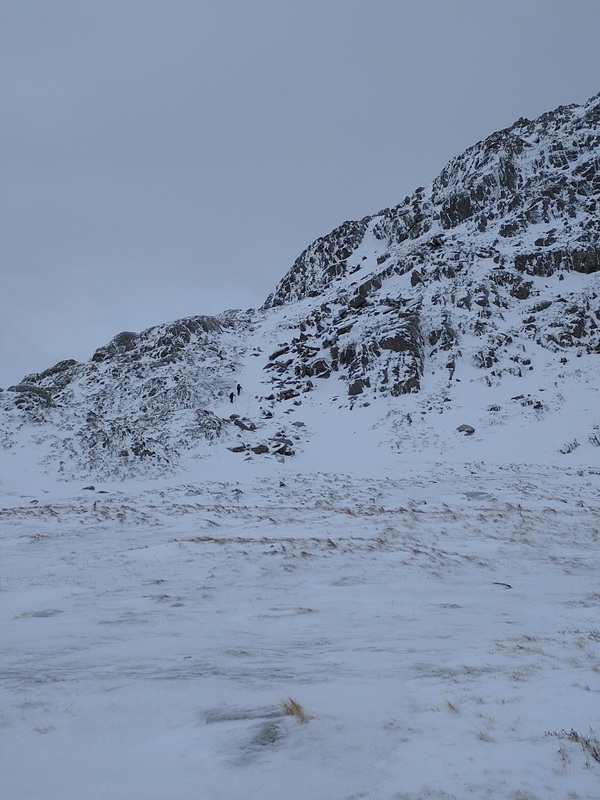 This was enough to avoid falling over the cliff of Carnedd Ugain into Cwm Glas: this was our destination, just not so direct a route! We walked to the end of the ridge, and lunched at Gyrn Las. We were still fairly solitary even here, despite being in full view of the tens of people trekking up the main Llanberis Path to the summit of Snowdon. Time now for some more Mountain Leader skills: Rob and I had both been down this route before, so Mark took the lead to get us safely down the steep ground of the east side of Gyrn Las, a task he completed with confidence. All that remained was for us to continue back down Cwm Glas, over to the Cromlech Boulders, jump in the car, and head back to Siabod Cafe for more post-mountain sustenance. Today's treat was the amazing soup (I forget which flavour, but I think it was Carrot and Coriander? ), accompanied, of course, with another magnanimous hot chocolate with everything! Made it! Nice leading, Mark. Postscript: not as brief as I'd thought. Oh well. To quote William Cowper: "If in this I have been tedious, it may be some excuse, I had not time to make it shorter."